Today, people think about capital in a one-dimensional way: Whether it’s the savings of private individuals, the capital reserves held by pension funds, the start-up capital of entrepreneurs, or the capital gains taxes on investments, all of these are thought of as money. Yet capital is distinct from money. It is a definite structure, composed of different elements like physical goods, knowledge, and context, as well as peoples’ talents and experience. Money is only the simplifying accounting gimmick that helps us quantify the incredibly complex capital structure in a uniform manner. It serves as a basis for assessing the value of different forms of capital. Modern economics textbooks usually refer to capital with the letter “C.” This approach blurs the important fact that capital is not merely a single magnitude, an economic variable representing a magically self-replicating, homogenous blob, but actually a heterogeneous structure. Among the various economic schools of thought, it is first and foremost the Austrian School of Economics that stresses the heterogeneity of capital. Furthermore, Austrians have correctly recognized that capital does not automatically grow or perpetuate itself. Capital must be actively created and maintained through production, saving, and sensible investment. The generations currently living in our society are able to enjoy such a high standard of living as a result of decades or even centuries of both cultural and economic capital accumulation. One also has to differentiate between two types of goods in the production process: consumer goods and capital goods. We consume these goods; food is one example without any steps in between. Consumer goods are a means to achieve an end directly. Thus, food directly satisfies the basic need for nutrition. Capital goods differ from consumer goods in that they are way-stations toward the production of consumer goods that can be used to achieve immediate ends. Capital goods, therefore, are means to achieve ends indirectly. 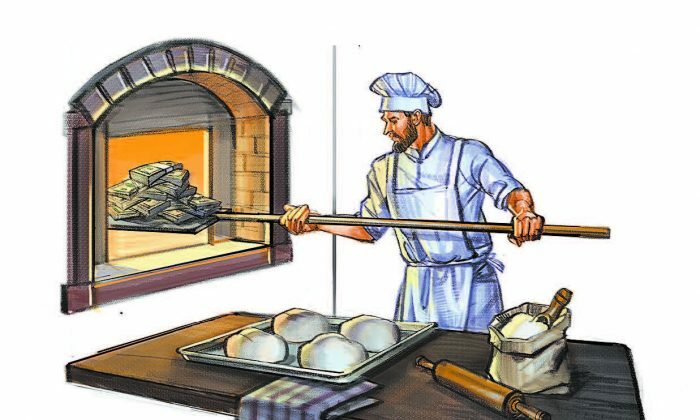 A commercial oven (used for commercial purposes) is a capital good that enables the baker to produce bread for consumers. Through capital formation, one can potentially boost productivity, if the capital helps to improve the production process. The baker can bake more and better bread with the oven rather than just roasting dough over a fire. But in order for capital to form, production of consumer goods must be temporarily decreased or even stopped, as scarce resources are then used to produce capital goods. For some time, while he builds the oven, the baker can’t roast as much dough over the fire. Every deepening of the production structure therefore involves taking detours. But capital formation is an attempt at generating larger returns in the long term by adopting more roundabout and sophisticated methods of production. Once the oven is up and running, the baker can churn out more and better bread with less effort. Such higher returns are by no means guaranteed though, as the roundabout methods chosen may turn out to be misguided and the calculations wrong. In the best-case scenario, only those methods that result in greater productivity will be widely adopted. Because only the best methods and production processes win in a competitive system, a more capital-intensive production structure will generate more output than a less capital-intensive one. The more prosperous an economic region, the more capital-intensive its production structure is. The fact that the generations currently living in our society are able to enjoy such a high standard of living is the result of decades or even centuries of both cultural and economic capital accumulation. However, once the capital stock has been built up, it is by no means eternal. Capital is thoroughly transitory; it wears out, gets used up in the production process, or becomes entirely obsolete. Existing capital requires regularly recurring reinvestment, which can usually be funded directly out of the returns generated on capital. If reinvestment is neglected because the entire output or more is consumed, the result is capital consumption. It is not only the dwindling understanding of the nature of capital that leads us to consume it without being aware of it. It is also the framework of the real economy that unwittingly drives us to do so. In 1971, our money system was cut loose from the gold anchor, and we entered the “paper money era.” Cutting the last tie to gold was a fatal mistake. Among other things, it has triggered unprecedented instability in interest rates. While interest rates displayed relatively little volatility as long as money was still tied to gold, they surged dramatically after 1971, reaching a peak of approximately 16 percent in 1981 for the 10-year U.S. Treasury, before beginning a nosedive that continues to today. It is this massive decline in interest rates over the past 35 years that has gradually eroded the capital stock. Saving just becomes uneconomical, and there is no capital formation without savings. If the income from savings, or more precisely the interest return on savings, buys fewer and fewer consumer goods, it becomes less and less worthwhile to save. Every pensioner living on fixed income knows that the income from savings has been declining, especially since the last financial crisis. Once zero or even negative interest rate territory is reached, the return on saved capital is no longer large enough to live off of, let alone maintain a reasonable standard of living. To make up for the shortfall in income, saved capital has to be consumed in order to secure one’s survival. One has to dig into principal to stay cash flow positive. Because of this multidecade trend, we see capital consumption everywhere today, in decaying public infrastructure like roads and airports as well as private production facilities in the Rust Belt. In addition, the policy of artificially reducing the interest as orchestrated by the central banks leads to a waste of resources and savings and therefore promotes capital consumption. Just think of the thousands of unfinished homes during the last subprime crisis. Human effort and physical resources were lost forever. On the other hand, the IT revolution, as well as the inclusion and development of the economies of Eastern Europe and Asia, has increased productivity globally and countered the inflationary forces and capital depletion in the developed world. Without these counteracting forces, it would have been necessary to restrict consumption in Western countries a long time ago. In addition, the all-encompassing redistributive welfare state, which continually shifts and reallocates large amounts of capital either directly through taxes or indirectly through the monetary system, manages to paper-over the effects of capital consumption, to some extent. We don’t know how much longer this process can continue, but once the stock of capital is depleted, it will be too late for regrets. Ronald-Peter Stöferle is a managing partner and portfolio manager at European asset management company Incrementum AG.